It’s this time of the year where the neighborhood smells sweet. Housewives and women of the family would be traditionally gathering right now to bake batches of Maamool. The aroma sneaks out of the oven to reach every sense of smell around and makes one desire to eat Maamool instantly. Hopefully this ritual will never go out of style, as it adds excitement to this beautiful occasion. Maamool is very popular in Lebanon during Easter and I’ve been asked for the recipe hundreds of times. I hope you will love it as much as I do and appreciate the artist behind this elegant treat. I think who ever invented it, did care about each of his taste buds. Who would have thought about the mix of this fragrant dough coming from the combination of the rose water and the orange blossom water. The result is a delicious cookie that melts in your mouth and the pistachio filling gives it a soft chomp. Impressive! Mix coarse semolina, fine semolina and sugar together. Add yeast and melted butter and rub with hands until well combined. Gradually pour WARM orange blossom water and rose water, kneading the dough gently with hands. Place the dough in a large bowl and cover with a wet kitchen towel. Let it sit for 1 hour at room temperature. To make the filling, combine all ingredients. Divide the dough in 2. Scoop walnut size of maamoul dough and flatten it on the palm of your hand, fill it with pistachios or walnut filling and make a ball. Repeat this step until you finish the dough. Press gently each ball into a traditional “Maamoul” mold to take shape and tap out on the baking sheet to drop out of the mould. If the dough is sticky, lightly flour the mold. In a preheated oven 200C/400F bake the maamoul cookies for about 15-20mn or until the sides are slightly golden. Sprinkle with icing sugar, while still hot. Let cool down and sprinkle again until fully covered. 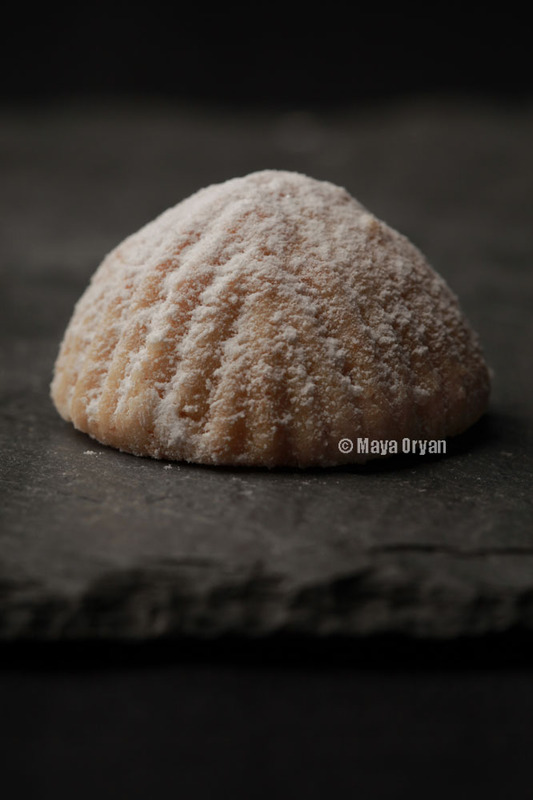 This entry was posted in Desserts, Recipes and tagged arabic sweets, Easter cookies, Eid, icing sugar, lebanese food blogger, Lebanese food stylist, levant, Maamool, Maamoul, Mayas Ingredients, MayasIngredients, Middle Eastern sweets recipe, pistachio, walnut by Maya Oryan. Bookmark the permalink. May I just add that leave the semolina mix rest longer yields a better dough, mom’s tip.